How to add color to a room without breaking your budget. Do you find that your home needs a pop of color, but the thought of repainting your walls makes you want to stick forks in your eyes? I hear you. Luckily, there's a relatively easy way to jazz up your space without killing yourself physically, or breaking yourself financially. Take a look at your space, and choose a color that you would like to play up with your accessories. Different color choices will provide a different feel in your space. The color wheel is a great reference point if you feel color choices don't come to you instinctually. Neutral beige toned walls would be somewhere on the left where the oranges start to move into the yellows, if that helps. To make colors "pop" against your wall, choose something on the opposite side of the color wheel. For accessories that blend in a bit more rather than stand out against the wall, choose something closer in range on the wheel. This is what I did with my fireplace, as an example. I decided to keep it pretty simple and used blue and white as my accent colors. 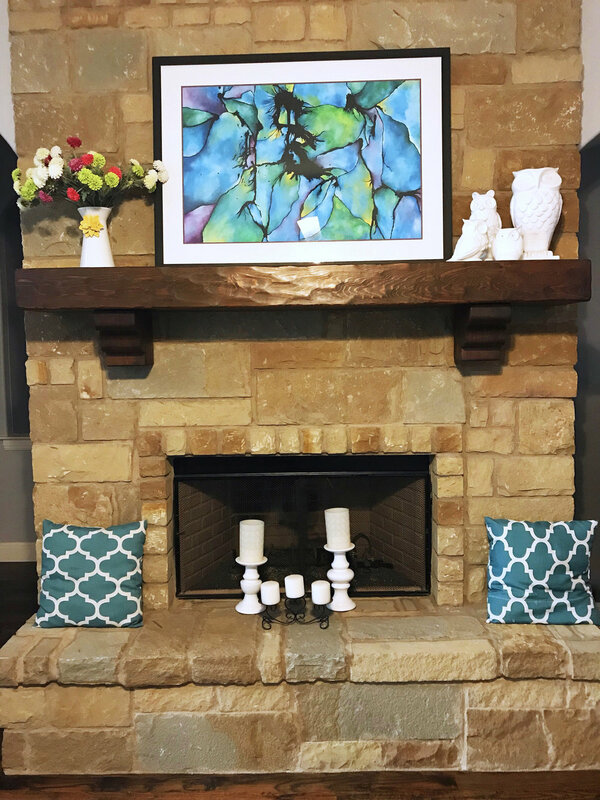 I painted the artwork and used the blue from the piece as the color inspiration for the pillows, and to balance the "weight" of the art piece by bringing your eye down with color and pattern in the pillows below. The white in the ceramic owls, candles and vase tie everything together (including the pillows). The most expensive piece (besides the cost of framing the canvas - which I think is unique to artists, lol!) was the pillows at $24.99 each. By purchasing during sales and knowing ahead of time what color palette I was looking for, I was able to zone in on the items I wanted. For unique art prints at affordable prices, please check out our store. Our prints are available in different sizes to accommodate a variety of spaces.